- Lets make a GUI for FASM linux..
- And lets make a IDE for console Fasm.. It may be nice to have an idea for linux but for windows there are already several options available in radasm, fresh and I guess we could include fasmw as well although it's only an editor. IMHO the control from fasmw cannot be used. It uses a lot of WinAPI, but it just couldn't be avoided. The idea behind the control should of course remain the same, but it will have to be written from scratch. When I was writing fasmw I split an edit control into core and interface in a similar way that fasm itself, because I planned to make DOS and Linux interfaces for it aswell. I later forgot about it but the architecture still permits it. Making a DOS textmode interface shouldn't be a hard task (it would be actually just a new incarnation of old "flat editor", whose rewrite was the first AsmEdit control used in old "Assembler Workplace" IDE, which was then rewritten to become fasmw) and I may try doing it soon. 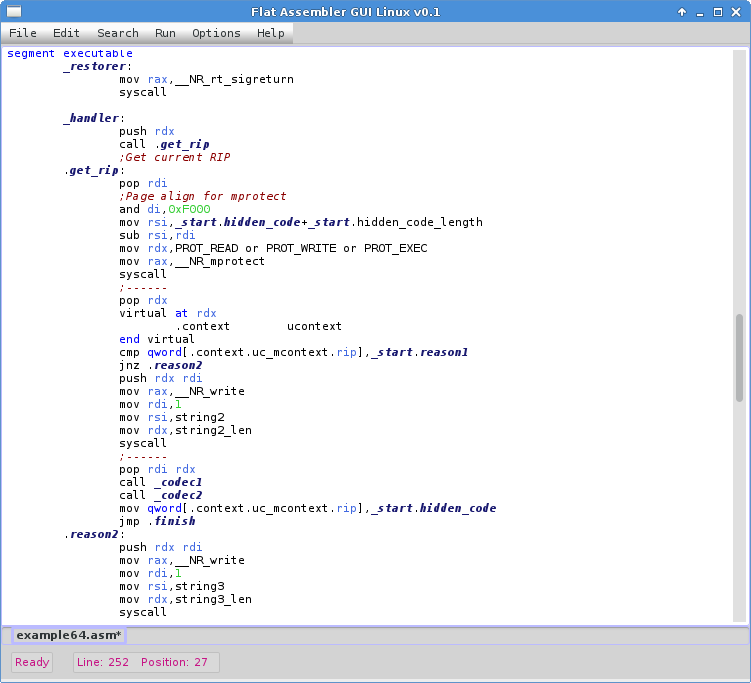 As for the Linux I've got not enough experience with the X programming yet, but I assume it still should be possible to write some decent X interface for fasm's editor core. The problem with X programming is that you just won't find anything close to MS SDK for Windows programming. Instead, you have to dig around for X manuals, then the manuals of whatever front-end you want to go with, unless you want to build menus/dialogs/etc. from scratch. I started writing a portable GUI for HLA, but never got past opening a basic window which allowed drawing some lines and text, and mouse handling controls. Only good enough for very simple applications. Once my Linux box is back up, I'll be improving it as time permits. It seems to be a nice project. The easiest path to program GUI on Linux is to use some GUI Library available for C/C++. I like to use one called FLTK - Fast Light Tool-Kit ( www.fltk.org ), because as its name says it's fast and light! So it could be done by creating the GUI part in C++ with FLTK and doing the other parts (including optimization) in FASM. This GUI could also be portable between Linux, Windows, and other platforms that FLTK supports. This is just an idea. But if you want to code this all in FASM, you'll have to study hard the X coding, and good luck! Works fine with asm, note, there are examples with its use on the old and maybe still the new fasm site? Yes. Using a C GUI toolkit in ASM would be great learning experience and also a portable way to develop. If someone is still interested - I've been recently doing some GTK programming (just for fun) and it comes out as a basic FASM GUI for Linux. There's still nothing special about it, no exceptional features or something, but, should there be a demand for such application, I will try to devote more time and thought to it. Here's the screenshot of the GUI.